The Whissendine Good Neighbour Scheme (WGNS) uses voluntary effort from local people to provide help for anyone in the village who needs assistance with transport, household tasks, companionship, practical support following illness, letter writing, form filling and more. If you need help, visit the WGNS website by clicking www.whissendinegns.org.uk. 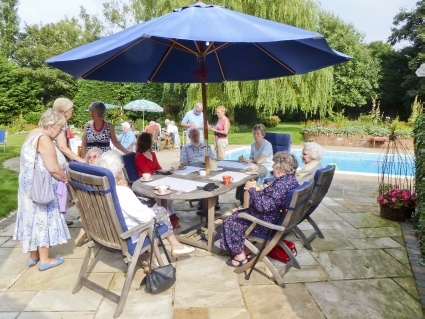 The Whissendine Good Neighbour Scheme Summer Tea Party, held in August, was enjoyed by clients, volunteers and supporters. Visit the WGNS website and call the number provided. A co-ordinator will arrange for a registered volunteer to help. Transport to appointments at the hospitals in Oakham and Melton Mowbray; doctors; opticians; hairdressers; dentists; or shopping in Oakham or Melton Mowbray. Household tasks such as changing light bulbs; replacing batteries or moving small items of furniture. Companionship for folks who would like a chat and a cup of tea or maybe a game of Scrabble. Support while recuperating from illness with things like gardening; taking the children to school; light housework or caring for pets. Help with writing letters or filling in non-legal forms; reading to people with visual impairment; learning to use email and the Internet. Who can use the Whissendine Good Neighbour Scheme? The WGNS has a wheelchair, for the use of their volunteers and other residents of the village. It is located in the church. Anyone wishing to borrow it on a short term basis should contact WGNS to arrange the loan. If you’d like to volunteer, please visit the WGNS website. Donation envelopes are available should anyone wish to contribute to the running costs of the scheme. For minutes, accounts, statistics, volunteers’ and consultants’ pages, and further links, please visit the WGNS website.